In a bowl mix the salt, sugar, mustard seeds and dill. Scatter about a quarter of the mixture over a piece of cling film – this needs to be large enough to wrap around both fillets. Place one salmon fillet, skin-down, on top. Scatter over two-thirds of the remaining mixture, then lay the second fillet, flesh-side down, on top so the thick part of the fillet rests on the thin part of the one beneath. Scatter on the rest of the salt mixture. Wrap the cling film around the fillets to make a parcel, then wrap in foil. You will need two heavy – ideally cast iron – roasting pans that fit one inside the other. Place the salmon inside the larger pan, then put the smaller pan on top (if this isn’t cast iron, weigh the pan down with a can or two). Chill for forty eight hours, turning the fish parcel every twelve hours. The sugar and salt will draw the juices out of the salmon, creating a sticky brine. Blend all the ingredients together in a bowl and set aside to stand for ten minutes. If making in advance, cover and chill. Unwrap the salmon and carefully rinse the marinade off the flesh side – some of the mustard seeds and dill should remain, but get rid of any excess salt and sugar. Place the fillets, skin-side down, on a work surface, lay a double sheet of kitchen paper over the top and press down to absorb and excess liquid. Sprinkle each flesh side with 1 tbsp chopped dill and press down well until it sticks. Trim the edge of the fillets if very thin, then slice the gravlax diagonally off the skin, thicker that you would smoked salmon, discarding the ends. The mustard sauce will need a quick stir before serving. 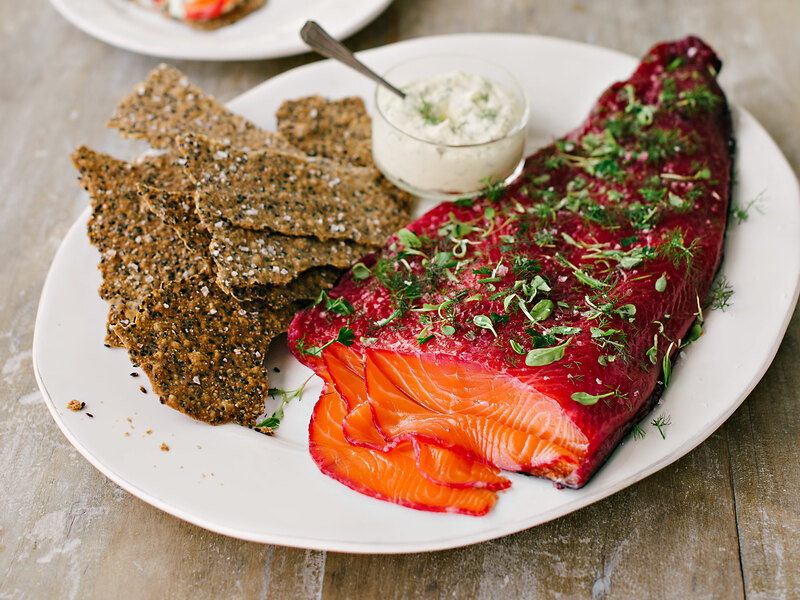 The gravlax and sauce are delicious withe buttered soda bread, accompanied by breakfast radishes. Taken from How to Cook by ANNIE BELL, published by Kyle Books. How long do you think this would last in the fridge? Always wanted to try to make it at home…thanks for sharing! Glad you enjoyed the post. Gravlax will keep in the fridge for up to a week covered in cling film.